B. Thomas (Arlington, Texas, United States) on 30 June 2017 in Lifestyle & Culture. 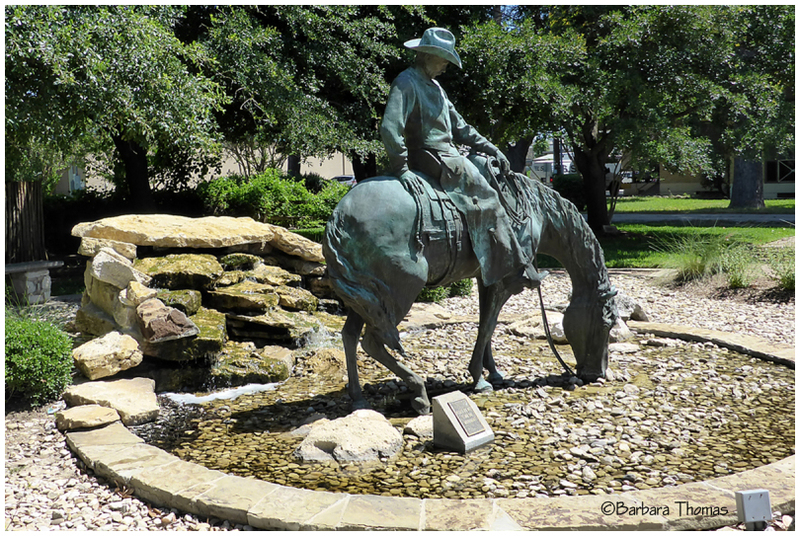 In 1999, the city of Clifton, Texas, unveiled Heritage Plaza, a park in the downtown area highlighted by a life-size bronze monument, sculpted by local artist Bruce Greene. The statue commemorates not only the early settlers of the area, but also the importance of the Chisholm Trail to the area. Such memorials help people remember history. Unless you know history, you can not plan for the future. A superb image of this monument, and the information you provide. Un bel hommage à ce texan à cheval. Beautiful bronze sculpture!! I love how it's been designed around, making it the focal point. A fine picture of this attractive statue. I like it very much. Aves les rocher et l'eau qui s'écoule quel cheval et cavalier superbe. Beautiful statue and a superb composition ! A beautiful sculpture and great installation. Lovely statue. I hope the cattle don't feel this is an example of blatant specieism, and demand that the statute be removed. @Harry: Exactly! LOL, as crazy as the world is now, that could happen!